This year marks the the 75th reunion for the class of ’43 which includes it’s most famous alumnus, Billy Graham. 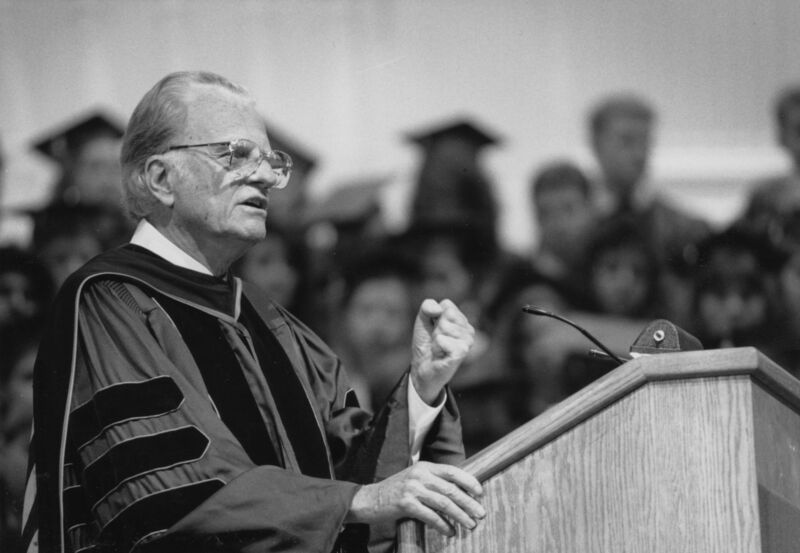 Twenty-five years ago, the famed evangelist gave the commencement address during his 50th reunion weekend. 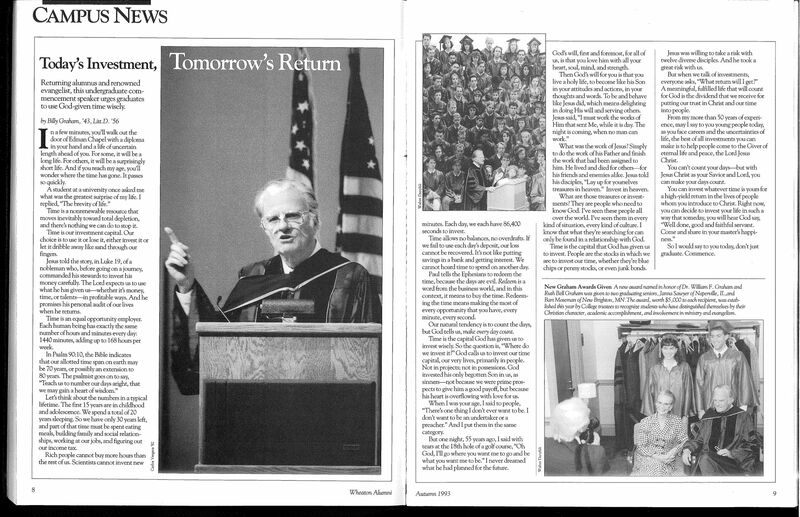 Below is a transcript of his address to the class of 1993 taken from the Wheaton Alumni Magazine, Autumn 1993. Returning alumnus and renowned evangelist, this undergraduate commencement speaker urges graduates to use God-given time wisely. Time is a nonrenewable resource that moves inevitably toward total depletion, and there’s nothing we can do to stop it. Time is our investment capital. Our choice is to use it or lose it, either invest it or let it dribble away like sand through our fingers. Jesus told the story, in Luke 19, of a nobleman who, before going on a journey, commanded his stewards to invest his money carefully. The Lord expects us to use what he has given us–whether it’s money, time, or talents–in profitable ways. And he promises his personal audit of our lives when he returns. Time is an equal opportunity employer. Each human being has exactly the same number of hours and minutes every day: 1440 minutes, adding up to 168 hours per week. Let’s think about the numbers in a typical lifetime. The first 15 years are in childhood and adolescence. We spend a total of 20 years sleeping. So we have only 30 years left, and part of that time must be spent eating meals, building family and social relationships, working at our jobs, and figuring out our income tax. Rich people cannot buy more hours than the rest of us. Scientists cannot invent new minutes. Each day, we each have 86,400 seconds to invest. Time allows no balances, no overdrafts. If we fail to use each day’s deposit, our loss cannot be recovered. It’s not like putting savings in a bank and getting interest. We cannot hoard time to spend on another day. Paul tells the Ephesians to redeem the time, because the days are evil. Redeem is a word from the business world, and in this context, it means to buy the time. Redeeming the time means making the most of every opportunity that you have, every minute, every second. Our natural tendency is to count the days, but God tells us, make every day count. Time is the capital God has given us to invest wisely. So the question is, “Where do we invest it?” God calls us to invest our time capital, our very lives, primarily in people. Not in projects; not in possessions. God invested his only begotten Son in us, as sinners–not because we were prime prospects to give him a good payoff, but because his heart is overflowing with love for us. When I was your age, I said to people, “There’s one thing I don’t ever want to be. I don’t want to be an undertaker or a preacher.” And I put them in the same category. But one night, 55 years ago, I said with tears at the 18th hole of a golf course, “Oh God, I’ll go where you want me to go and be what you want me to be.” I never dreamed what he had planned for the future. God’s will, first and foremost, for all of us, is that you love him with all your heart, soul, mind, and strength. Then God’s will for you is that you live a holy life, to become like his Son in your attitudes and actions, in your thoughts and words. To be and behave like Jesus did, which means delighting in doing His will and serving others. Jesus said, “I must work the works of Him that sent Me, while it is day. The night is coming, when no man can work.” What was the work of Jesus? Simply to do the work of his Father and finish the work that had been assigned to him. He lived and died for others–for his friends and enemies alike. Jesus told his disciples, “Lay up for yourselves treasures in heaven.” Invest in heaven. What are those treasures or investments? They are people who need to know God. I’ve seen these people all over the world. I’ve seen them in every kind of situation, every kind of culture. I know that what they’re searching for can only be found in a relationship with God. Time is the capital that God has given us to invest. People are the stocks in which we are to invest our time, whether they’re blue chips or penny stocks, or even junk bonds. Jesus was willing to take a risk with twelve diverse disciples. And he took a great risk with us. But when we talk of investments, everyone asks, “What return will I get?” A meaningful, fulfilled life that will count for God is the dividend that we receive for putting our trust in Christ and our time into people. From my more than 50 years of experience, may I say to you young people today, as you face careers and the uncertainties of life, the best of all investments you can make is to help people come to the Giver of eternal life and peace, the Lord Jesus Christ. So I would say to you today, don’t just graduate. Commence.